That change, however subtle, has coincided with Trudeau’s success in drawing a distinction between Liberal and NDP policy on deficits — a massive u-turn on Trudeau’s prior pledge to balance Canada’s budget if elected prime minister. It’s a gambit not without risk, opening Trudeau to charges of flip-flopping and reckless spending from both the Tories and the NDP. Notably, however, Ontario’s voters allowed former premier Dalton McGuinty to rack up deficit after deficit in the 2000s and rewarded him with three consecutive mandates. Trudeau, taking advantage of Canada’s flagging economy, has committed the Liberals to running budget deficits of up to $10 million annually through 2019 to help boost infrastructure and otherwise to spur economic growth as the country’s resource-dependent economy adjusts to lower global oil and gas prices. That’s a controversial position in some ways, because the push for balanced budgets has been Canadian policy consensus not only in the Harper era but also throughout the 1990s when Liberal prime minister Jean Chrétien, in tandem with Martin as his finance minister, committed to re-calibrating Canada’s fiscal balance. 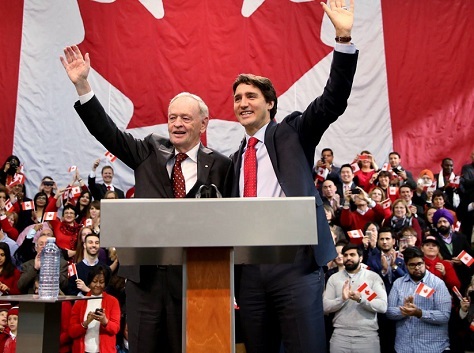 It’s no surprise, then, that Trudeau has welcomed the 81-year-old Chrétien to the campaign trail to provide his seal of approval to the new Liberal approach. Both the Conservatives and the NDP have promised throughout the campaign to balance Canada’s budget. Though those pledges might easily fall to the wayside if the Canadian economy deteriorates further, it’s an important difference between the Trudeau and Mulcair approaches to the campaign. Though it’s instinctive to argue that the NDP sits to the left of the Liberals, that’s not necessarily correct, especially in the context of the 2015 election. That might have been true in the past, when the NDP and its predecessor, the Co-operative Commonwealth Federation, existed primarily to advocate social democratic stands on health care and economic and social policy. But now that the NDP is the official opposition, that voters view Mulcair as a plausible (and increasingly capable) prime minister, and that the NDP has its best shot to lead the next government, the party now finds itself hugging the middle. That’s left the NDP in the unfamiliar position of receiving attacks from the left — from Trudeau on the economy and from Green Party leader Elizabeth May on pipelines and environmental policy. While the NDP has promised not to touch personal income tax rates (instead arguing for a modest rise in corporate tax rates while cutting rates for small businesses), Trudeau has not shied away from a fully redistributive tax plan, which promises increases for those who earn more than $200,000 annually and a tax cut for the middle class. The biggest impact of Trudeau’s deficit gamble might yet come in Québec, where voters will watch the first of two French-language debates starting tonight. With an electorate that skews more to the left than the national electorate, Quebeckers may yet warm to Trudeau’s economic message, even though the NDP still maintains a wide lead in the province today. The NDP won over two-thirds of Québec’s ridings in the 2011 ‘orange wave,’ and every poll gives the party, under Mulcair, a former provincial minister, a wide lead with less than a month to go before the election. If Trudeau, however, can unlock the NDP grip on Québec, it might put the Liberals within grasp of majority territory. Mulcair, who succeeded Jack Layton as the NDP leader upon Layton’s death from cancer shortly after the 2011 election, always represented the more centrist approach. From 2003 to 2007, he served as Québec’s environmental minister as a member of Québec’s Liberal Party (only loosely affiliated with the federal Liberals), then under the leadership of premier Jean Charest (a former leader of the now-defunct federal Progressive Conservative Party in the late 1990s). It’s no secret that Mulcair, in mulling the leap from provincial to federal office, flirted with joining Harper’s Tories in the late 2000s. But there’s also a sense that Mulcair and the NDP know that, having no track record running a national government, it must project a moderate image. After the disastrous one-term government of NDP premier Bob Rae in Ontario (who jumped to federal politics as a Liberal and served as interim leader for nearly two years between Ignatieff and Trudeau) and the NDP’s staggering loss of what seemed like a sure victory in the 2013 British Columbia provincial election, the NDP believes that the centrist path is the shortest one to forming a federal government. That’s certainly been reinforced by the development-friendly approach of Rachel Notley, elected in May as Alberta’s first-ever NDP premier. The risk for the Liberals is that centrist voters see Trudeau’s budget deficit promise as a dangerous departure from three decades of bipartisan consensus, further highlighting that he isn’t up to the job of prime minister. In an election where voters seem to want to punish Harper for the economy, that makes it even easier for them to embrace Mulcair’s NDP as a triangulating median point. The risk for the NDP, however, is that Trudeau usurps the mantle of the truly social democratic voice in Canada (and, above all, in Québec). By drawing such a strong contrast with Harper, Trudeau may find a way to unite the center-left voters currently split between the Liberals and the NDP, thereby pushing Mulcair’s NDP back to more familiar territory as Canada’s third force.